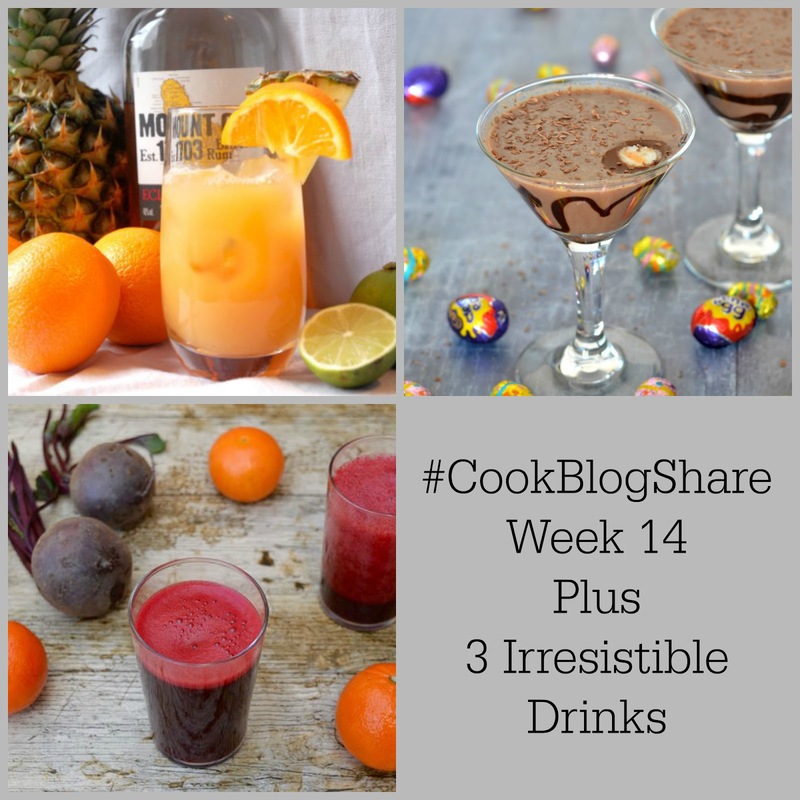 Hijacked By Twins: #CookBlogShare 2018 Week 14 - Plus Three Irresistible Drinks! #CookBlogShare 2018 Week 14 - Plus Three Irresistible Drinks! Hello foodies and welcome to week 14 of the CookBlogShare linky. I hope you all had a tasty Easter weekend. We enjoyed fish on good Friday which was followed by a mouthwatering roast lamb dinner cooked by the hubby on Easter Sunday! I will admit to being a mad shopper on the Saturday before Easter Sunday. I suddenly remembered that I had not picked up any fresh rosemary for the roast and every single shop (yes, I made the hubby drive to all of the supermarkets in the area!) had sold out. This meant that we had to rethink our roast ideas and if I am completely honest, it was even better! I simply left some dried rosemary in some rapeseed oil to soften with some chopped garlic and sea salt then before putting the leg of lamb in the oven it was scored and rubbed with the oil. It was that simple and so tasty. It is lovely to have some time off work and being at home with the family. This week is going to fly by, the hubby has gone back to work today but is off from Thursday as we are having a week up in stunning Northumberland. This is my idea of pure bliss. I love Northumberland and always find holidays there so relaxing. I am looking forward to plenty of beach walks, freshly caught fish and delicious food, time out and quality family time. I am even planning on some time out from social media and having a true break from everything. Anyway, back to CookBlogShare. Last week the linky was hosted by Monika at Everyday Healthy Recipes who did an Easter inspired round up. There were so many Easter recipes shared and despite looking so good, I have decided to go for a different theme this week. Rum punch always makes me think of the summer and holiday time. Goodness knows we need some sunshine after the terrible weather that we have been having. So as soon as I saw this Tropical and Fruity Rum Punch from Jess Eats and Travels I knew that it would be a perfect drink! We both love dark rum and combined with the fruit juices this is the ideal drink to get you dreaming about the sunshine! The following drink that, despite having a Cadbury's creme egg in, I kept coming back to was this Creme Egg Vodka Martini from The Crazy Kitchen. I do have to admit that I am not a creme egg fan, but I am sure that mixed with vodka it would make a great drink! Even more so once it has been mixed with the Bailey's, pass the creme eggs now!!! The third and final recipe that I chose is a healthier juice. This Beetroot Juice with Orange and Ginger from Tin and Thyme would be an instant hit with everyone in our house. The children love beetroot, as does the hubby and I, and with this vibrant colour, what is there not to love? Healthy, delicious, easy and full of nutritional benefits, that ticks all the boxes for me! Now onto this weeks linky. I have been having some discussions with my lovely co-hosts Eb from Easy Peasy Foodie, Monika from Everyday Healthy Recipes and Jacqui from Recipes Made Easy about how the linky is managed. I will admit that I was close to saying that I need to stop. However after plenty of emails I have decided to keep on hosting. I love this linky and love how much it has grown but the workload can be too much especially when working full time. So to make it easier on all of the hosts from now on we will share all of your posts throughout our social media channels, we will open up the Pintrest board for you to pin your recipes and we will share our favourites each week however we simply do not have the capacity to comment on all of the posts as this is the time consuming part. I sincerely hope that nobody minds these changes it is just that as the linky has grown, the time needed to comment has also grown. Please add the badge below to the post that you are sharing in the linky. This shows others how to get to us and join in or view more recipes. Comment on this or the recipe labelled 'host' post. Comment on some of the other recipes that have been shared. I am so glad you are staying on as a host Kirsty, these changes will help us all, great roundup and have a lovely holiday! Enjoy your time off, that sounds wonderful! Thank you for hosting and organising us co hosts, it certainly would not be the same without you. Enjoy your trip to Northumberland and area of the country I would like to but have yet to visit. Have a lovely time in Northumberland. When I went it rained quite a lot but we still had a great time and it really is beautiful. We did go in November so I'm sure you will have much better weather! I totally understand Kristy. It is hard to comment on all blogs when you also have a real life.Have a great break! It is really hard to comment on each post. We had to give that up too, and now return comments left on our blogs. The Pinterest board still gets action and I feel that is the biggest social media bang. Congrats to you all for the big decision! I hope you had a wonderful holiday with family and friends. Today I brought some ideas for leftovers for your holiday Ham, a Chicken Broccoli Cheddar Cheese Wreath, and my newest dessert, Peanut Butter Chocolate Chip Cheesecake. Enjoy your week! I also forgot the rosemary when I cooked lamb the week before Easter, and did similar to you & also added an oxo cube to the rub, which made a lovely crust! A break in Northumberland sounds wonderful. Enjoy your time off. And thank you for featuring my beetroot juice. Nutritious and delicious, though sadly CT is not a beetroot fan.